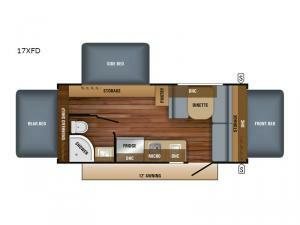 When you need time away from your busy schedule, and need more time to enjoy the simpler side of life, then come enjoy a weekend camping in this Jayco Jay Feather 7 expandable 17XFD. This model can easily sleep seven people with the front, rear, and side tent beds, plus at night you can convert the dinette into a sleeping spot for a weary camper. With the five year warranty on the water-repellent, scratch-resistant Jayco DuraTek vinyl material you can rest assured that you will not get wet inside while camping. Enjoy the spacious, open interior which also features a nice kitchen area with a refrigerator, microwave, and a two burner range.